Ok, how do I even begin to explain this one? 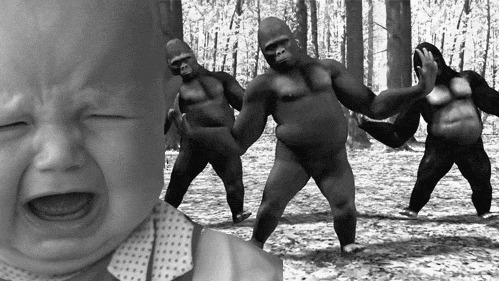 This is an animated gif of a baby crying while a bunch of Gorillas dance and frolic around in the background. This is apart of the "that really rustled my Jimmies" meme, which tends to be used whenever somebody is feeling extremely annoyed and upset about something. The meme began with an image macro of a gorilla, so I'm guessing that the kid in this gif represents somebody who has had their Jimmies rustled, with the gorillas representing those who have caused the "rustling". Basically, its an extension of "troll culture". Ok, I think I'm done now.